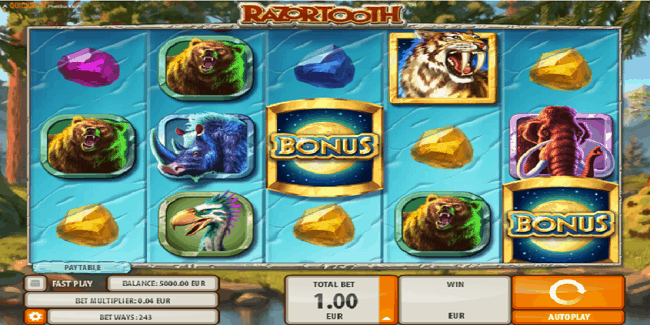 Razortooth is an online slot powered by Quickspin software platform. This slot is of 243 paylines and 5 reels for which minimum and maximum coins per line are just 1. You can play this slot for a coin size range 0.25 per spin to 100 per spin. The slot offers a jackpot of 200 coins and return of player percentage is also very good. This slot is all about prehistoric ages where fang-toothed animals were found. Razortooth Slot has perfect graphics as well as background sound and the reels of this slot are being set against the backdrop of an icy blue wood background. You can play this slot at any Quickspin casinos accepting players from your country. These casinos accept players from all around the world including United Kingdom, European Union countries and from Canada. The game offers various winning combinations. You should adjust coin size before starting the game. Some options of the game are “total bet”, “spin” and “auto play”. The “total bet” option is used to change the coin size which ranges from 0.25 to 100. The “spin” option is used when a player need sot start the game and the ‘auto Play” option is used when a player wants to play the game for a chosen or selected number of times continuously without any interruption. The wild symbol of this game is Razortooth logo which can be substitute for all other symbols excepting the scatter symbols which is the Bonus Moon symbol. There is a Hunt Random wild feature available in this game and during this feature 3 additional wild symbols will be added. If you land 3 or more of the scatter symbols (the Bonus Moon symbols) on the reels, you will trigger free spin feature and that means 5 free spins will be awarded to you. During free spin feature another wild symbol known as Savage Wild symbol appears which is a 1×3 stacked wild symbols. It can also substitute for all other symbols but not the bonus scatter symbol.